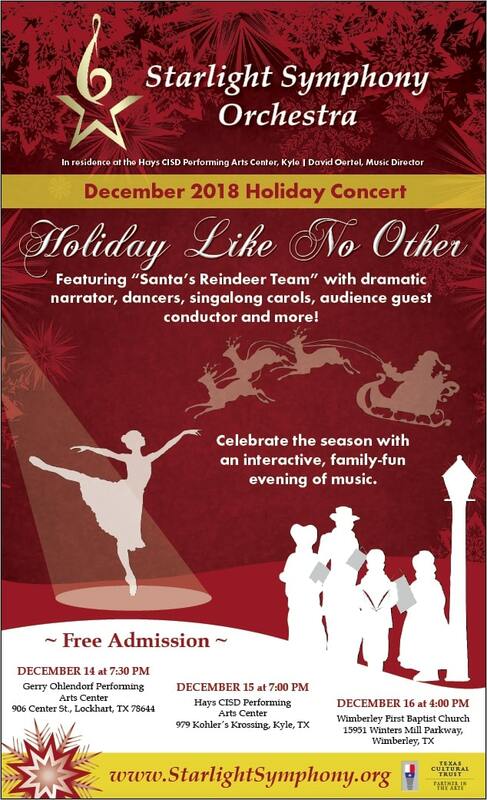 Join the Starlight Symphony Orchestra as it celebrates the holiday season with a concert themed “A Holiday Like No Other.” Traditional sing-a-longs, a dramatic narrator and more provides an interactive, family-fun evening of heartwarming holiday favorites! The performance will be Friday, December 14, 2018, at 7:30p.m., at the Gerry Ohlendorf Performing Arts Center, 906 Center St., in Lockhart, TX. The Starlight Symphony Orchestra concerts are always free and open to the public. Learn more at www.starlightsymphony.org.